Yesterday, I met with Republican Senators at the White House and told them that now is the time for action. Obamacare was a big lie. “You can keep your doctor”—lie. “You can keep your plan”—lie. Now, people are hurting, and inaction is not an option. We must repeal and replace this disaster. The Senate should not leave for summer recess until it has passed a plan to give our people great healthcare. I’m ready to act; I have pen in hand. I’ll sign the legislation into law, and then we can celebrate for the American people. Yesterday, President Trump hosted a Made in America Roundtable with 20 American companies and 4 members of Congress. The discussions were focused on the importance of manufacturing products in American factories with American workers. President Trump hosted a lunch with members of Congress to discuss the problems with healthcare and to urge not only the repeal, but also the replacement of the disaster known as Obamacare. President Trump's new plan for healthcare will substantially lower premiums, repeal burdensome taxes, expand coverage options, protect preexisting condition coverage, improve medical outcomes for low income Americans, and redirect authority from Washington D.C. to the states so they can innovate and develop the best practices for the American people. Yesterday, Vice President Pence was joined by several elected officials at the first meeting of the Presidential Advisory Commission on Election Integrity, which is designed to explore and fix vulnerabilities in the voting process to ensure the integrity of our system. Today, President Trump and Vice President Pence will be making an announcement at the White House regarding a Pharmaceutical Glass Packaging Initiative. Tomorrow, President Trump will welcome the survivors of the USS Arizona to the White House. On Saturday, President Trump will travel to Norfolk, Virginia, to attend the commissioning of the USS Gerald R. Ford. 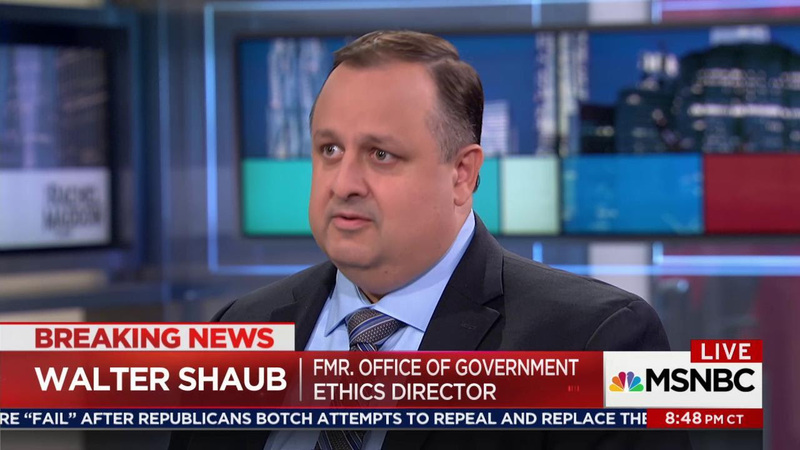 Walter Shaub, former director of the Office of Government Ethics, talks with Rachel Maddow about the appropriateness of A.G. Jeff Sessions' recusal from campaign-related investigations, and Donald Trump's inappropriateness in addressing his myriad conflicts. Noon marks six months of President Trump's time in office, and with one-eighth of his term down, it's hard to overstate just how besieged he is. A taste of the headlines just today: his agenda is stalled, he's turning on his Cabinet members, he's ensnared in a growing Russia probe, top aides are expressing doubts about his strategy on domestic and international affairs, and members of his own party are losing patience with his antics. So many of these problems are self-inflicted, as he's never failed to choose the path of greatest resistance. On Russia, for instance, he denied that country's election hacking efforts for months, fired his FBI director over his oversight of the probe and then watched as his aides and family members failed to disclose their meetings with Russia officials during the campaign—all that before the president himself discussed classified matters with senior Russian officials and held a solo meeting with Vladimir Putin without telling anyone about it. Now, senior aides, including National Security Advisor H.R. McMaster are reportedly complaining about his judgement on these matters. On healthcare, he's thrown members of his own party under the bus time and again, and only appeared to engage in selling legislation that most of America is against Wednesday, when it appeared to already be dead. The confounding choices by the president is epitomized by his Wednesdayinterview with the New York Times in which he drew a "red line" for special counsel Robert Mueller, said he regretted selecting Jeff Sessions as his Attorney General and once again waded into the Russia scandal news. First off, this is "Made in America" message week at the White House, and Trump had already tried to drive headlines with a forceful defense of the Senate healthcare bill—he effectively wiped both off the news with his comments. Beyond that, the president demonstrated that not only is he intent on being his own strategist and spokesman, he wants to be his own attorney too—as he ignored the advice of counsel that he refrain from commenting publicly on the investigation and refocus on the task of governing. What is also clear is that despite winning the highest office in the land, the president is deeply frustrated with just about everyone and everything—after just six months. TIME reveals the Obama administration's secret plan to stop Russian hacking in 2016. Massimo Calabresi's report details the former White House's efforts to protect the U.S. voting system and the challenges in preventing the next hack. Trump's China honeymoon is over. Congressional Republicans' lament. And Trump's election commission has some preconceived notions about voting.